Deception techniques if deployed well can be very effective for organizations to improve network defense and can be a useful arsenal for blue teams to detect attacks at very early stage of cyber kill chain. But the challenge we have seen is deploying, managing and administering decoys across large networks is still not easy and becomes complex for defenders to manage this over time. Although there are a lot of commercial tools in this space, we haven’t come across open source tools which can achieve this. 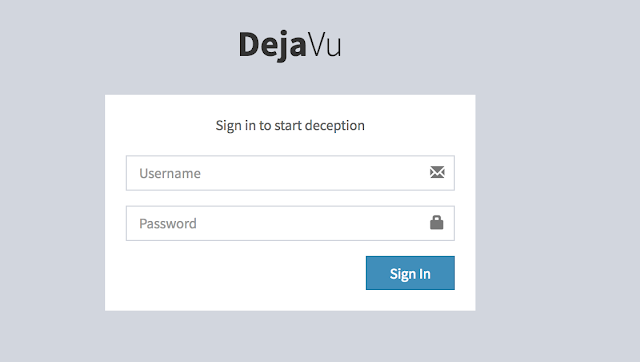 With this in mind, we have developed DejaVu which is an open source deception framework which can be used to deploys across the infrastructure. 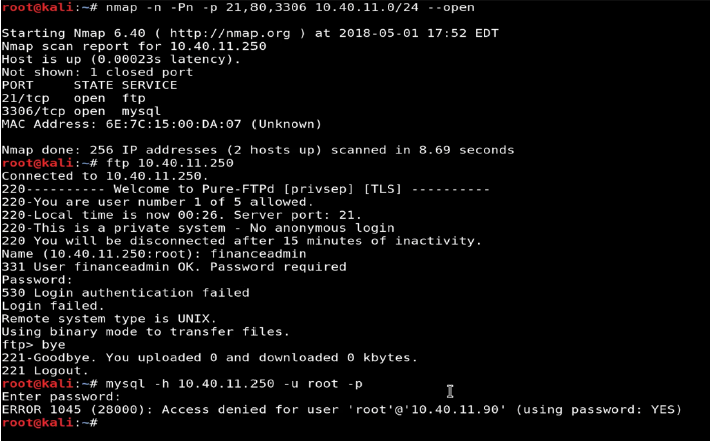 This could be used by the defender to deploy multiple interactive decoys (HTTP Servers, SQL, SMB, FTP, SSH, client side – NBNS) strategically across their network on different VLAN’s. 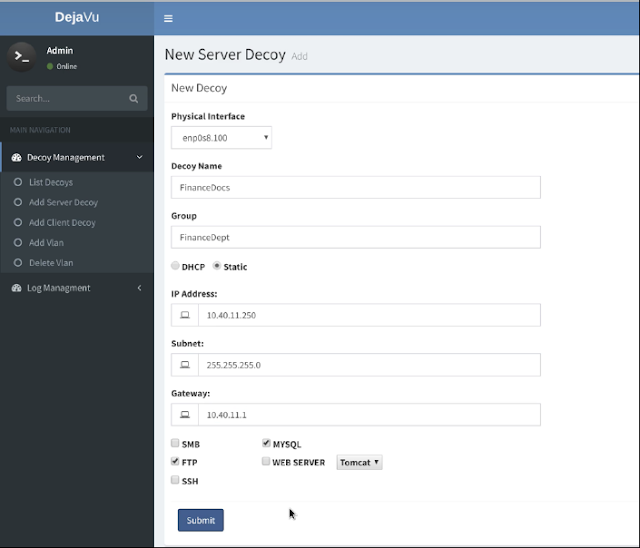 To ease the management of decoys, we have built a web based platform which can be used to deploy, administer and configure all the decoys effectively from a centralized console. Logging and alerting dashboard displays detailed information about the alerts generated and can be further configured on how these alerts should be handled. If certain IP’s like in-house vulnerability scanner, SCCM etc. needs to be whitelisted, this can be configured which effectively would mean very few false positives. Alerts only occur when an adversary is engaged with the decoy, so now when the attacker touches the decoy during reconnaissance or performs authentication attempts this raises a high accuracy alert which should be investigated by the defense. Decoys can also be placed on the client VLAN’s to detect client side attacks such as responder/LLMNR attacks using client side decoys. Additionally, common attacks which the adversary uses to compromise such as abusing Tomcat/SQL server for initial foothold can be deployed as decoys, luring the attacker and enabling detection. 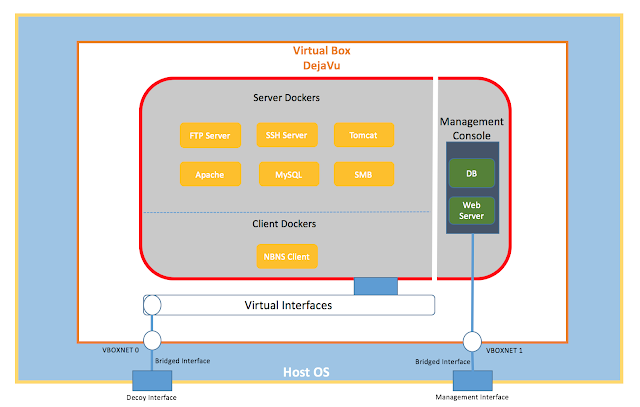 DejaVu Virtual Box: Debian based image containing open source deception framework to deploy multiple interactive decoys (HTTP Servers, SQL, SMB, FTP, SSH, client side – NBNS). Virtual Interfaces – Interfaces bridged with decoy interface to channel traffic towards the decoys. Management Console (Web + DB) – A centralized console to deploy, administer and configure all the decoys effectively along with logging and alerting dashboard to display detailed information about the alerts generated. 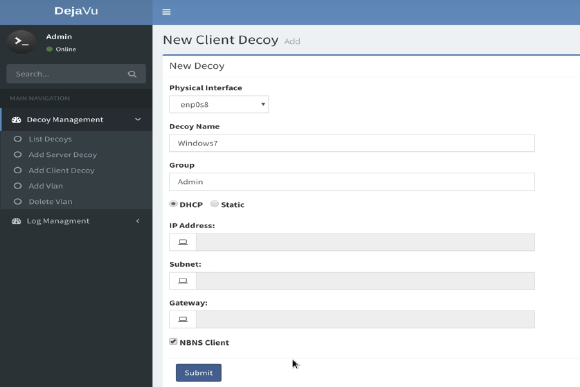 To add a decoy, we first need to add a VLAN on which we want to later deploy Decoys. Enter the VLAN ID. 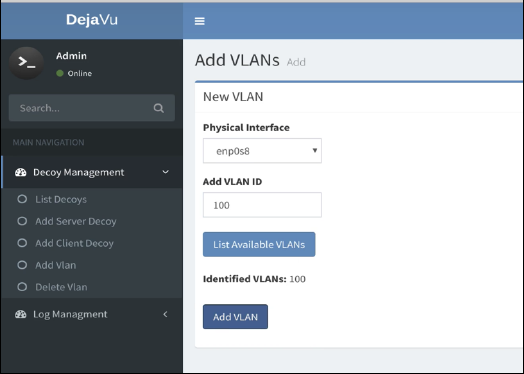 Use the “List Available VLANs” option to list the VLANs tagged on the interface. Provide the details for new decoy as shown below. Select the services (SMB/FTP/MySQL/FTP/Web Server/SSH) to be deployed, use dynamic or provide a static IP address. View the alerts triggered when the attacker scanned our decoy and tried to authenticate. Provide the details for new decoy as shown below. It’s recommended to place the client decoy on user VLANs to detect responder/LLMNR attacks. View the alerts triggered when the attacker scanned our decoy and tried to authenticated. 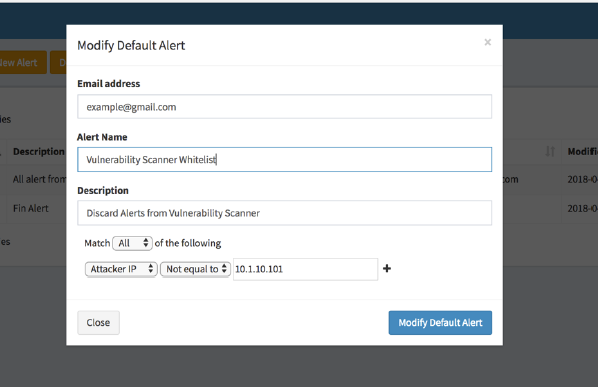 Alerts can be configured based on various parameters. Example – Don’t send alerts from IP – 10.1.10.101. If certain IP’s like in-house vulnerability scanner, SCCM etc. needs to be whitelisted. This entry was posted in Pentesting tools. Bookmark the permalink. Somos expertos en la evaluación de riesgos tecnológicos, consultores, auditores e ingenieros de seguridad informática. Nuestra misión es proteger los sistemas informáticos de nuestros clientes mediante nuestros servicios de consultoría, auditoría, ingeniería, implantación y formación. Teléfono: 93 672 49 38. La Ciberseguridad de su empresa debe empezar por la evaluación del nivel de seguridad de la misma.